No man like to see his hair fall out, especially if you take pride in how your hair looks. I'm afraid it's the inevitable for most men as the majority of male baldness is hereditary, so take a glance at your Dad or Grandad and get a sense of how long you've got left with your luscious locks. However, this guide will aim to tackle the problem, and hopefully prevent it. Read more Men's Health features. Knowing whether or not that your hairline is receding can bit a little tricky, especially if you're constantly looking at it. Always checking in the mirror can be damaging to the self-esteem as you take every hair that falls on your pillow as a sign that your luscious lock's days are numbered. The statement "my hairline is receding" is thrown around a lot, but you don't know until you've taken the correct procedures. One telltale sign is if you grab your hair and gently pull away from scalp; don't yank it, else this will just pull it out, but if it's coming out with ease on a gentle pull, then this may be a sign of hair loss. 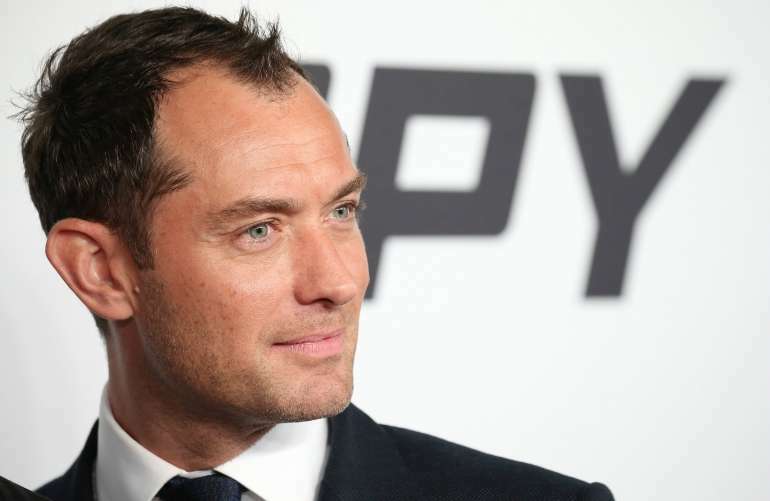 A receding hairline for men can be a tricky thing to come to terms with, but if you know the signs, then it may be preventable. If you think that you're losing your hair, then there may be some other causes for this. Take a look at what is happening in your life, this isn't going to be a counselling session, but certain factors that are happening in your life may be causing you to lose your hair. Stress is very big factor in someone losing their hair, so, if you want to know how to stop losing your hair, then it may help to remove yourself from a stressful situation. There are levels to this, as shock can contribute to hair loss as well. Again, look at whats going on in your life, and see what you can do to change things that are causing you to feel stressed or anxious, as this may tell you how to stop your hairline from receding. Unfortunately, losing your hair is sometimes just a factor of life, whether it's genetics or something else. Most men can't avoid this, so take a look at your Dad's or Grandad's hair, are they bald as can be, thinning or still have a flowing mane to be proud of? 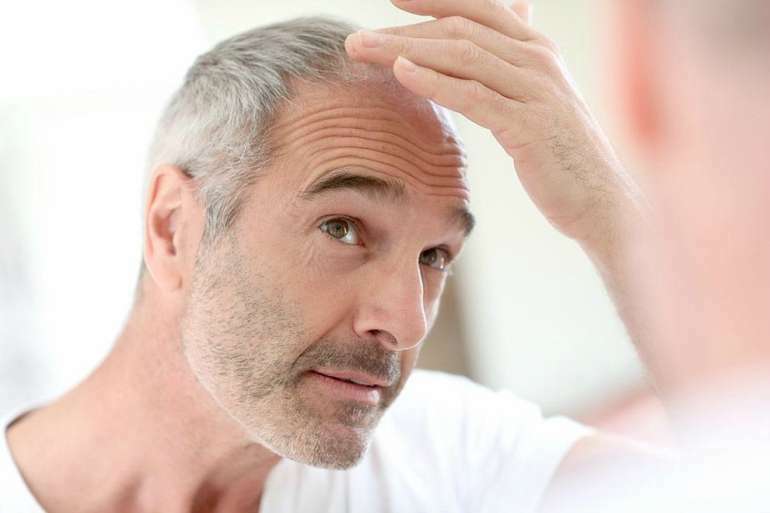 Age is a massive factor in men losing their hair as 40% of men have noticeable hair loss by the time they're 35, but some may be even earlier, again, this is down to genetics. Ask your Dad or Grandad what age they started to shed as this may be an indication for your own outcome. Again, knowing how to stop a receding hairline can be tricky, as there isn't a fundamental hair loss cure, but there are hair loss treatments available should you wish to do so. To put it simply, the medical term for male pattern baldness is male pattern baldness. I know it's not the long, convoluted medical term some of you were wishing to find, but it does what it says on the tin. However, the word alopecia has a slightly more interesting history behind it. The word 'alopecia' stems from the Greek word 'alopex' which means fox. The fox, to the ancient Greeks, would develop a certain skin condition were their fur would fall out called 'mange', and when a term for someone who lost their hair was needed, 'alopecia' was coined, or 'fox-mange'. 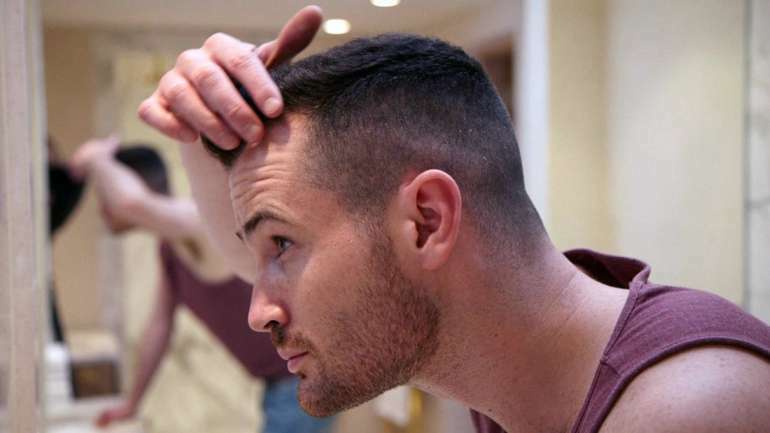 There are a plethora of treatments out there for men who are suffering from hair loss from surgeries and transplants to the more natural, herbal kind that many choose to opt for. Regaining a receding hairline or attempting to regrow your receding hairline can be tricky, as, I'm afraid, it can end in disappointment. 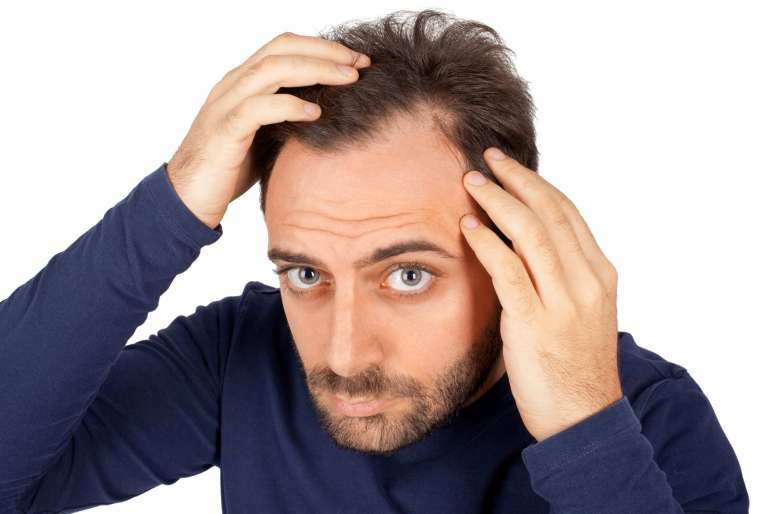 When you see your hairline receding it can induce a slight panic amongst most men, especially when you start to see receding temples, but have no fear, there are some treatments out there that may help with you predicament. FUE Hair transplants or hair plugs are medical procedure that many men decide to go for as it can produce some of the best and quickest results. This will require you to consult with a doctor and they can tell you the best procedure for you, but, a hair transplant works by taking clumps of skin with hair follicles from the sides and back of your scalp. These clumps of skin are then plugged into the bald sections of your head to encourage hair growth. Now, this isn't a cure for baldness, hair transplants, famously, are known to not work sometimes and they can cost a lot of money in the process. Again, speak to your doctor as they'll be able to tell you the best process for you to take. 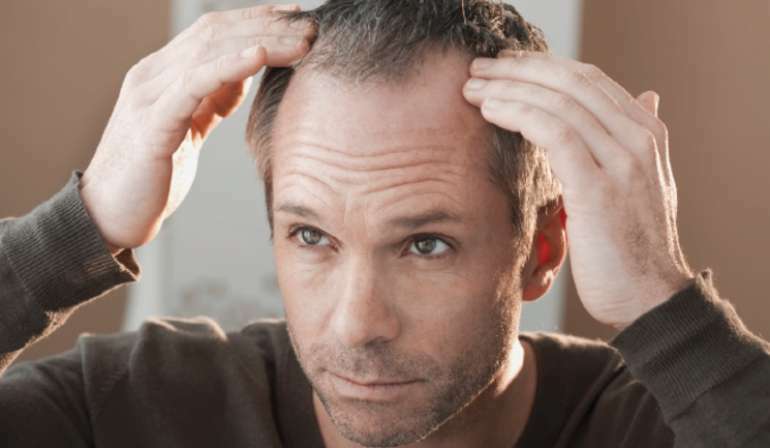 Preventing a receding hairline is a simple process that requires only slight changes in your habits and diet. For some, stopping baldness or knowing how to stop balding is inevitable, those luscious locks will, unfortunately, leave you and there's not a lot you can do about it I'm afraid. 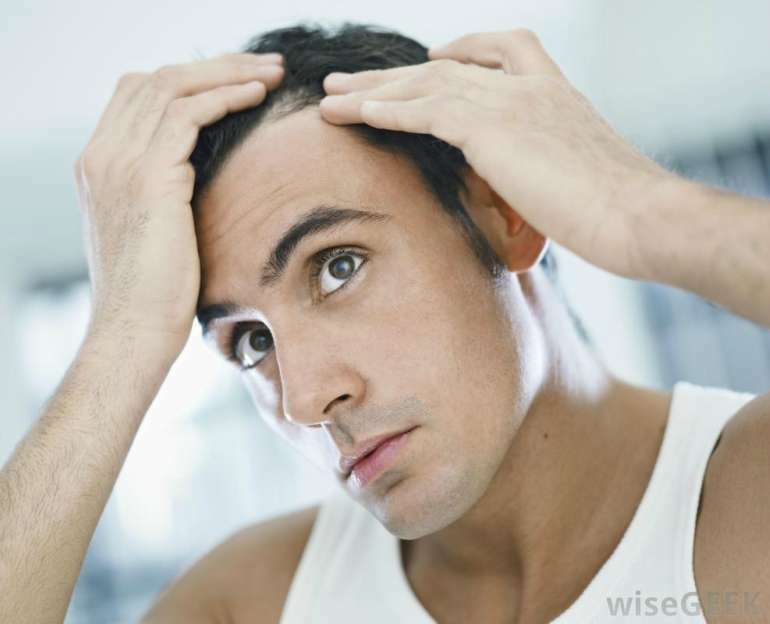 However, knowing how to prevent hair loss in men can be equated down to a few simple lifestyle changes. 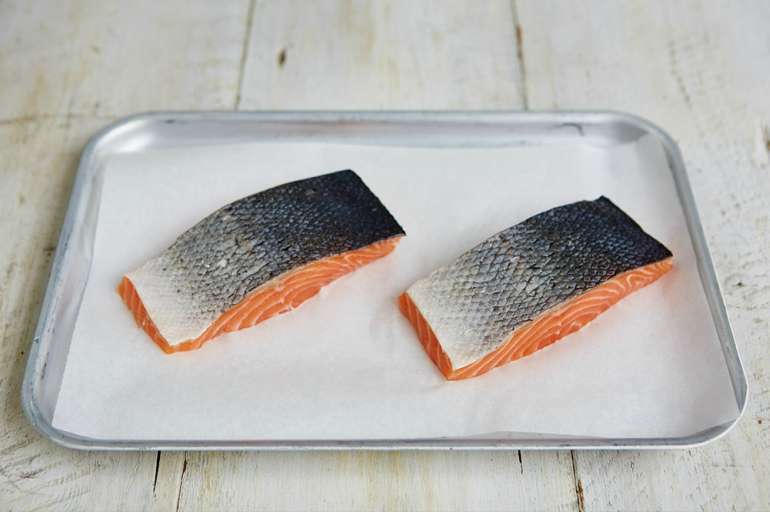 Your diet plays a massive part in knowing how to stop a receding hairline as a diet rich in protein and iron will help fight against the balding. Now, this isn't a cure for a receding hairline, but it will certainly help tackle it. If you have, or have ever had, an eating disorder, then this may be a reason for your shedding scalp; also crash dieting as well, as you're denying your body of the nutrients it needs to help regrow your hairline. If, like most people, touching your hair is simply a part of everyday life, even if you don't know you're doing it, can be a cause of hair loss. Now, this is different for everybody and not everyone will experience this as much as other people, but taking these precautions can be a receding hairline solution. Avoid touching your hair too much, as this can make it greasy and can also pull the hair out of the follicles, leading to hair loss at the temples and other places. So, keep your hands off of your hair! Excessive washing of your hair can also be a contributing factor to hair loss. If, like a lot of men, you decide to put product in your hair everyday, then this needs washing out with various, chemical laden shampoos and conditioners. These can be extremely damaging to your hair, especially if your hair is naturally dry and brittle. 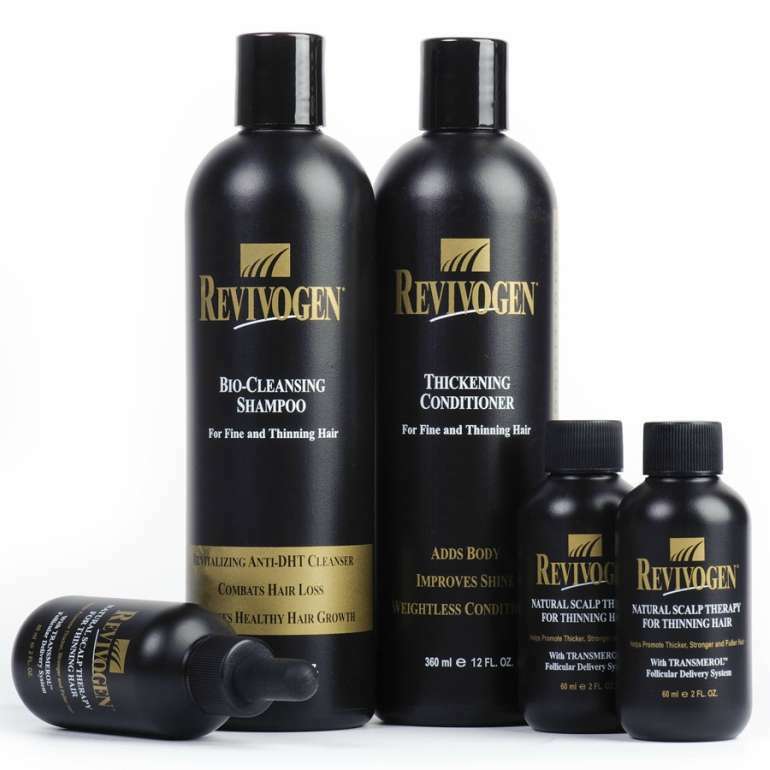 Excessive shampooing can cause the hair to dry out and snap, leading to hair loss. Knowing what to do about a receding hairline can be a struggle, especially if your hair has just started to fall out inducing a slight panic. But there are a few remedies and procedures you can do to treat or fix a receding hairline to put the panic at bay. There are many hair loss shampoos and balding shampoos out there for men, but it's all down to personal choice which one works for you. Again, I'd suggest consulting a doctor about this as you don't want to cause a reaction nor make the situation worse. If you're not into using a massive amount of chemicals on your hair, and I don't blame you, then there are some more natural, herbal remedies widely available for you to try. While these might not grow your hairline back, they can certainly offer a slight relief when it comes to hair loss, especially when it comes to thinning hair for men. For many, castor oil is a great way to induce hair growth. This isn't a 'how to fix balding' or hair loss solution for men, but it can help. You'll want to get some castor oil and gently massage it into your hair, this, according to research, stimulates blood flow encouraging hair growth. This is a remedy that you'd have to try for yourself, but it can be a cheaper alternative and one of the best treatments for hair growth. Now, The Idle Man can't recommend any medications for you to take for hair loss as you will need to consult doctor before you take anything. Many people have found that taking certain balding medications or medications for hair loss have helped them, but always consult your doctor. 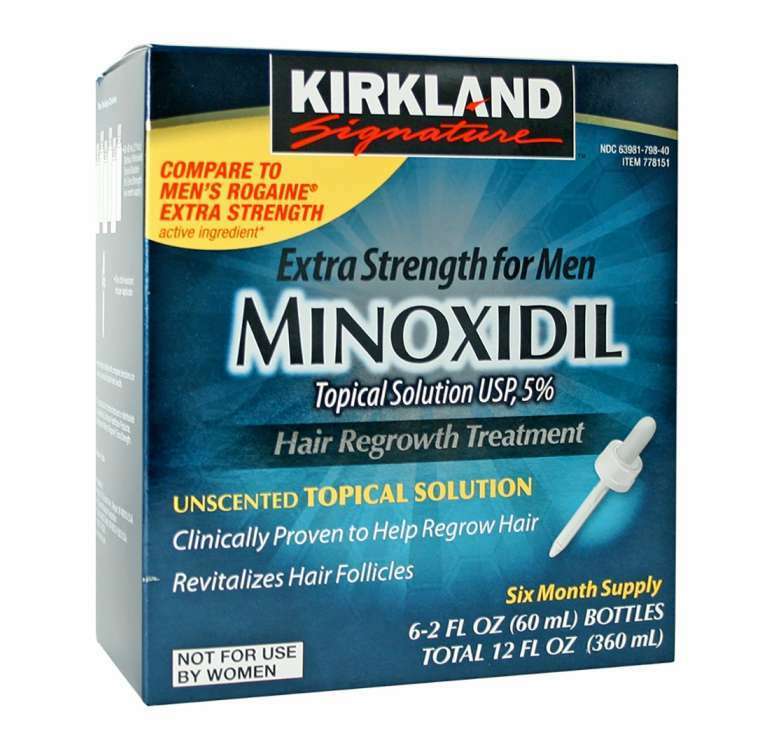 Minoxidil is a chemical that is widely used for regrowing hair, and knowing how to make your hairline grow can be a frustrating endeavour. Again, you must consult a doctor before you take or apply anything to or for your hair. Minoxidil was originally used to treat people for high blood pressure, but one of the side effects was hairline regrowth. Again, a lot of men who suffer from hair loss decide to take hair regrowth pills. I must urge you to consult a doctor before you take anything as you don't know what reaction you will have from them. 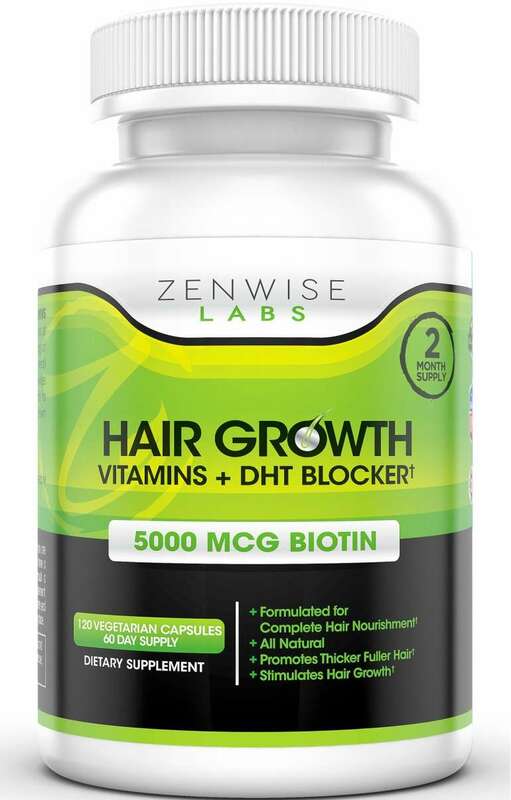 Hair growth for men can be tricky, so taking a course of hair growth pills may be a good option for you. Fixing a bad hairline can be simple, as, sometimes, all you need to do is get a style or haircut that can help mask it. But knowing how to grow back your hairline is a little more difficult. Many would suggest seeking our a minor hair transplant or hair plug to replace the hair that was there or you can/must consult a doctor about taking medication for it. Don't pull at your hair! Look at your family, if there's a history of male pattern baldness then the likelihood of you having it is higher. Your diet has a massive impact on your hair growth as does your age. Hair transplants or hair plugs are an option. Always consult a doctor before you take any medication for hair loss. The dreaded feeling when you start to lose your hair can be horrible, but there are some measure you can take to help keep your luscious locks in tact and ready to fight another day. Take a look at your lifestyle; if you're particularly stressed, have had a change in diet or have male pattern baldness in your family then the likelihood of you losing your hair is higher. With a plethora of remedies out there, both medical and herbal, it can be difficult to decipher which one will work for you. 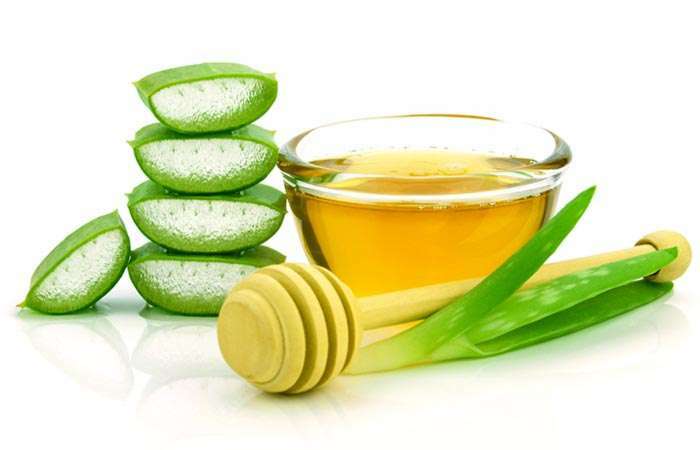 If you're planning to take any form of medication or prescribed shampoo then always consult a doctor, but for anything herbal, then it's a course of trial and error. Treatments such as hair transplants and hair plugs are an option, but they aren't the be all and end all solution.